Sofia loves to have fun and does so always. But sometimes there are troubles that can happen with everyone. So with a little girl Sophia was a nuisance. She fell into the bushes and scraped my hand. Now she has a sore arm and the girl doesn't know what to do. She knows that she needs to treat the hand, but she's afraid of doctors. Sofia thinks that doctors will reinforce the pain in her hand. Let's help the cute girl and help her go to the doctor to make her healthy hand. 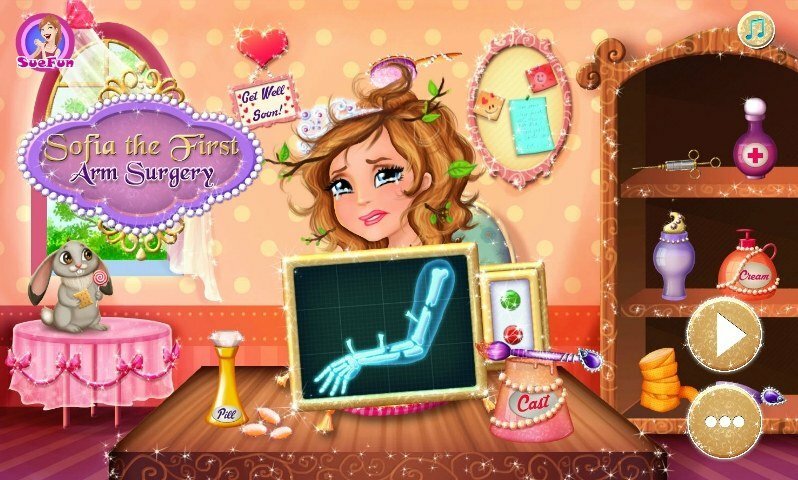 How to play: in this game you will be able to help the doctor to cure his hand with a little girl Sophia. Use the tips in the game and the mouse to perform simple actions. Played: 19017. Added: 16-11-2015, 01:59.